The primary goal of ACE is to assist individuals who are currently receiving cancer treatment, or who have completed treatment within the last three years, adopt an active lifestyle. Participation includes a 12 week exercise program of Transition and 12 weeks of Maintenance along with 4 study assessments over the first year and a follow-up questionnaire annually for five years. Participants take part in a combination of aerobic, resistance, balance and flexibility exercises which are designed to be incorporated into a sustained program of exercise and healthful activity. Delivered in a circuit format or a personal training format on Tuesdays all day, Thursdays all day, and Friday mornings. 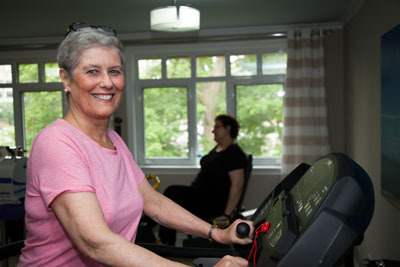 The Alberta Cancer Exercise program is a well-received program with members saying they have had considerable benefit in the improvement of their fitness and wellbeing. A CSEP-CEP with cancer-specific experience and training will assess participants to determine fitness, muscular strength, flexibility, balance and body composition. The results of this assessment will be used to design an exercise program that is specific to each participant’s fitness level and individual goals. For details on registration call (780)492-6007 or email: albertacancerexercise@ualberta.ca or call Wellspring Edmonton for further information: (780)758-4433.